Last week we talked about the importance of paying attention to and guarding against things that work against eating disorder recovery (or recovery from anything for that matter!). Today I want to talk specifically about our time in front of the mirror. Ah, the mirror. So many have a love-hate relationship with it. We often dislike what we see, but we can’t seem to go without it either. 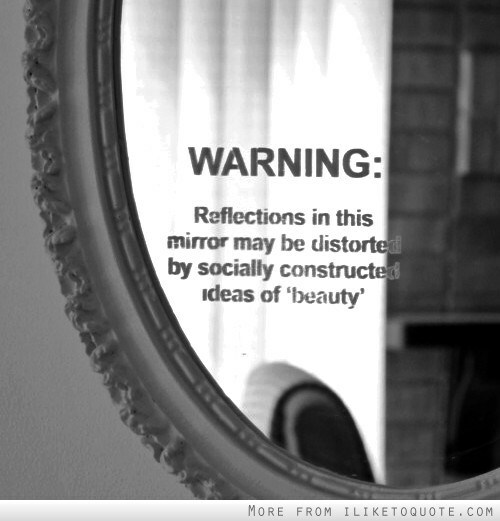 Many people with eating disorders and body image issues spend a lot of time body checking in the mirror. There is nothing about standing in front of a mirror for long periods of time or multiple times a day and inspecting your appearance that is helpful. If you spend a significant amount of energy focusing on the things about your body that you wish you could change, you will inevitably feel bad about yourself. One of the sad things about that is that no one is perfect, and each one of us could find flaws to obsess over. I read an article a while back in which Jillian Michaels admitted that she has cellulite on her rear, and there’s nothing she can do to change that. Considering that 100% of the human population is physically imperfect, how sad is it that we can become convinced that our individual flaws mean we’re not beautiful? And even worse… our self-perception is often spoiled by flaws that aren’t even there. See, that’s the problem with mirrors. They are not accurate reflections because it’s all about how our eye, and ultimately our brain, perceive an image. And that is highly subjective. Ever met someone that you thought was plain looking but after you got to like them, found them attractive? Or on the flip side, met someone attractive and then after discovering an atrocious personality, didn’t find them so physically appealing anymore? Our perceptions—even the ones that seem trustworthy, like our eyesight—can be very skewed based on our emotions and attitudes. Body checking in the mirror is about more than just seeing if you look okay. You’re wondering on a deeper level if you’re okay. But a mirror can’t tell you that. If it can’t give you an accurate reflection of your physical self, it certainly can’t give you a reflection of your inner self worth. So I’m throwing out a challenge to stop believing what the mirror tells you. Commit to reducing the time you spend body checking, and no matter how strong the urge to, definitely don’t stand there and pick apart your appearance. Decide there are more important things that you’d rather spend your time and energy on. How about doing something fun instead? What about doing something kind for someone else who needs it? And here’s an even bigger challenge…consider getting rid of your body checking mirror altogether. You don’t necessarily need to fast from all mirrors, but I’m guessing you might have a full-length one that you use for body checking and not just doing your makeup and hair. It sounds impossible, I know. I did it when I was in recovery, and I thought I wouldn’t make it. My anxiety was sky-high at first because I’d become addicted to the mirror. But after a week or two, I adjusted…and actually felt freer than I’d felt in a long time. I also realized how much more time I had because I wasn’t wasting it searching for answers that a piece of glass could never really give me anyway. Go for it! Break up with your body checking mirror, even for just a month, and see what a difference it makes in how you feel! I know you can do it.